I have been a huge fan and a regular customer at Soho Joe for a while now, yet for some reason until a few weeks ago have failed to visit their sister restaurant Cookhouse Joe. 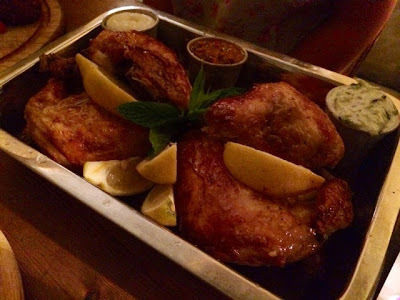 Where Soho Joe specialises in pizzas, Cookhouse Joe is all about the rotisserie chicken. The rest of the menu has a bit of a Middle Eastern theme with side dishes such as falafel, halloumi and houmous. The smell from the rotisserie ovens that floods your nostrils when you walk in is incredible, it’s instantly mouth watering. We were seated at the back of the restaurant right by the kitchen with a great view of the chickens that were lined up waiting to go in our hungry bellies. Chicken isn’t the only option at Cookhouse Joe, there are a few burger options and lamb koftas on the menu. 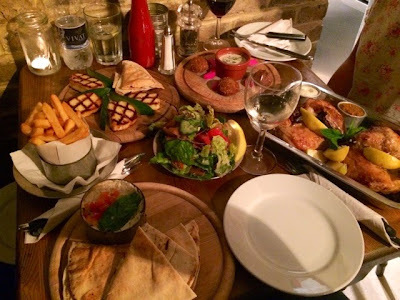 As there were three of us and we all wanted to sample the main event, and to try as many things as we possibly could, we decided that the best way forward would be to share a whole chicken and then as many sides as we could physically fit on the table. As you can see, we only just about managed it. 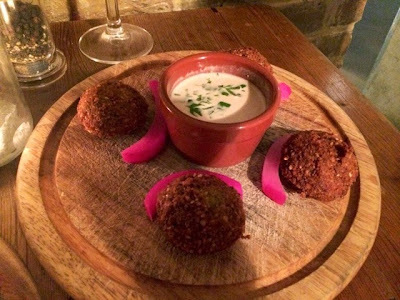 Falafel were very crispy on the outside and nice and soft in the middle, full of flavour. The cool and creamy dip complimented them well, but to be honest I often skipped this instead to dunk them into one of the sauces that came with the chicken or the aubergine mattoubal dip we had ordered. The little pink pickles served up as a garnish were really tasty too. I’ve never had mattoubal before, it was nice and I love to try new things but I think next time I’ll order the houmous instead as I think I’d prefer it. Grilled halloumi did not disappoint. 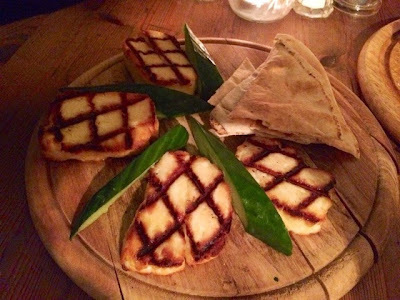 Such a simple favourite can easily go wrong but the halloumi at Cookhouse Joe was creamy, not a bit rubbery and grilled so it was just starting to go gooey in the middle with a nice crispy outside. The whole chicken was of course the star of the show. Having been able to smell the chickens roasting away on the spit ever since the moment I stepped through the door, I was positively drooling by the time it arrived at the table. The skin was nice and crispy and the meat underneath so juicy. So often we dismiss chicken as a boring bland and tasteless meat, but done like this at Cookhouse Joe it is instantly rocketed back up to the top of the great meat list alongside a juicy steak. We tried one of each of the three dips on offer the chilli was okay, not too spicy but I mostly left this one as it wouldn’t be my preference over the other two. Cucumber and mint was nice and cooling and was actually rather good when paired with the falafel. By far my favourite was the garlic dip, delicious and creamy I couldn’t get enough of the stuff. 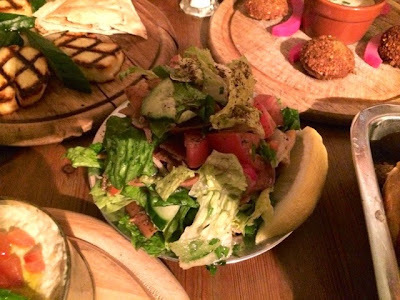 The least expected highlight of the evening was the fattoush salad. Fattoush is a Middle Eastern salad with crispy croutons (similar to panzanella) and dressed with lemon and spices. I can’t wait to try and recreate this dish at home, the flavours were so different from your typical vinaigrette or mayonnaise based dressings and somehow made the salad really more-ish. 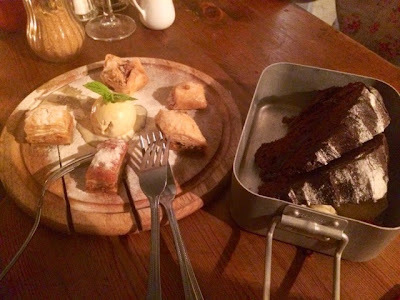 Desserts options are limited at Cookhouse Joe, only chocolate fudge cake and baklava are on offer. As sharing was the theme of the evening we ordered one of each and three forks! The chocolate cake was fine, it was a decent chocolate cake but no different from any other. If you really want to enjoy a dessert that stands up to the rest of the experience I recommend the baklava. Filo pastry layered with nuts and honey, baklava is like the divine dessert of the Gods and many baklavas consumed on holidays to Greek islands have long since secured its place at the top of my list of favourite puds. 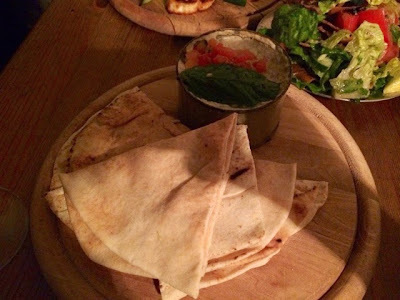 My favourite thing about dinner at Cookhouse Joe, aside from the wonderful food, was the relaxed and friendly vibe. It sort of feels like you’re having dinner at a friend’s house so you really couldn’t feel more welcome. 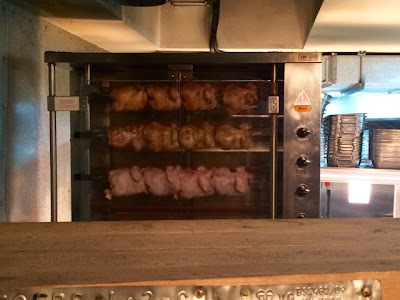 Just writing about it, the memory of the delicious smell of the rotisserie is coming back to me and I’m already thinking about when I can find a good excuse to go back. If you’re ever in Soho and fancy chicken, whatever you do, do not go to Nandos, go to Cookhouse Joe (handily there are now two branches: Berwick Street and Dean Street) I promise you, you will never look back.